The disproportionate impact of greenhouse gas emissions on the least privileged portions of society is not some distant threat; it is already taking place. Typhoon Haiyan’s destructive path through the Philippines in early November underscored the vulnerability of low income populations to super storms that climate change models predict will become more frequent. According to the latest estimates from the government there, more than 6,100 people have been reported dead and nearly 1,800 more are still missing three months after the storm ravaged the country. The vast majority of the casualties occurred in low lying areas where the storm surge hit hardest, areas most heavily populated by the poor. 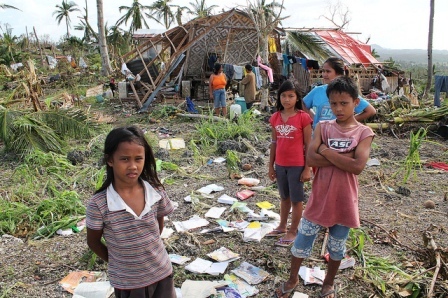 Typhoon Haiyan inflicted the worst damage on poor families in rural areas. Of course, climate change is not only wreaking havoc in developing nations. The U.S., England, and Australia, just to name three, are coming to grips with drought, floods, and brutal heat waves. The difference between these events and the Filipino super storm lies in the greater wealth and more robust infrastructure of industrial nations, assets that make them better able to deal with the growing consequences of climate change. All one has to do is compare the resources of the Netherlands to fend off rising sea levels with those of Bangladesh to grasp the point. It is nearly certain that extreme weather will become a fact of life in the 21st century. What isn’t certain is whether the developed world will become numb to its consequences and keep up practices that contribute to climate destabilization and make the lives of poor people even more exposed than they already are to the resulting destruction. Extended heat waves, food and water shortages, and disappearing coast lines will inflict enormous suffering on millions of people least able to absorb it. Democracy even in times of stability and prosperity is difficult to build and maintain; under the stress of global climate disruption, it will in all likelihood collapse in a heap. In short, we make a huge mistake if we think climate change, economic inequality, and democracy are separate issues having nothing to do with each other. If previously difficult to discern, the interconnections are now becoming increasingly evident. The destabilization of the climate is largely a product of the same forces – the rise of global corporate power and unprecedented technological exploitation – that have resulted in levels of economic and social stratification inimical to the survival of democracy in even its most diluted forms. The time is long past for those of us who are relatively well off to take stock of how we can act to protect the climate and reduce the vulnerability of those less fortunate than ourselves to its disruptive effects. Whether it is working to expand renewable energy in our communities, strengthening local food and farming systems, calling on universities and colleges to begin divesting from fossil fuel companies, challenging unchecked corporate greed, or insisting that our political leaders take seriously the science of climate change, there is a wide range of actions we can carry out on a daily basis that, cumulatively, will have a global impact. None of us can afford to stand on the sidelines. “We have the world to live in on the condition that we will take good care of it,” observes Wendell Berry in a recent interview with Bill Moyers. “And to take good care of it we have to know it. And to know it and to be willing to take care of it, we have to love it.” It is hard to think of a better way to spend time during the holidays than to reflect on what Berry says here and (re)commit to this timeless truth during the coming new year. President Obama, in his speech at Georgetown University yesterday, finally made clear that he was done waiting for Congress to act on the mounting evidence that climate change is already well underway. He announced a series of executive actions, none of them needing the approval of Congress, to crack down on carbon pollution from power plants, accelerate the growth of renewable energy, increase energy efficiency for commercial, industrial, and federal buildings, and prepare the nation for the impacts of climate change. Convince those in power to reduce our carbon pollution. Push your own communities to adopt smarter practices. Invest. Divest. Remind folks there’s no contradiction between a sound environment and strong economic growth. And remind everyone who represents you at every level of government that sheltering future generations against the ravages of climate change is a prerequisite for your vote. Make yourself heard on this issue. “Make yourself heard”: this is the essence of democracy. With so much at stake, this is no time to sit on the sidelines.